Bloomberg Sports Anchor Rob Shaw breaks down the five baseball players who have been making a huge fantasy impact over the past two weeks. Rios struggled with the White Sox in 2011, batting just .227. However, he has bounced back this season with a .316 AVG, 18 HR and 67 RBI. In the past two weeks alone, he hit .353 with 14 runs, five home runs, 15 RBI and one stolen base. He is a five-tool talent and his hot streak could continue, especially considering that he plays at hitter-friendly U.S. Cellular Field. 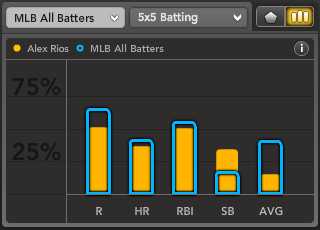 Be aware, however, that Rios is known for his inconsistency. Like Rios, LaRoche has struggled with inconsistency. Last year was a disaster for him, as he only played in 43 games and had just a .172 average. He is known for getting hot in the second half of the season and he is living up to that right now. In the past two weeks, LaRoche has a .429 average, 10 runs, seven home runs and 14 RBI. Gomez is a solid outfielder defensively but is not known for his offense. He hasn’t been able to play every day in the past but he’s been given a chance in Milwaukee and is putting up huge numbers. Over the last two weeks, Gomez is batting .348 with 14 runs, four home runs, 10 RBI and six stolen bases. At 26 years old, he could get a chance to play full time next season. Stubbs is known to be unpredictable at the plate. He steals a lot of bases and has some power but he kills your batting average. His currently has a .239 season average, but in the last two weeks, he has a .362 average with 17 runs, four homers, 11 RBI and five steals. Stubbs is a streaky hitter, so ride out this hot streak while you can. Pujols had a slow start to the season but he’s been on fire recently, and it couldn’t come at a better time for the Angels. Over the past two weeks, he has a .365 average, 11 runs, seven home runs, 19 RBI and two stolen bases. 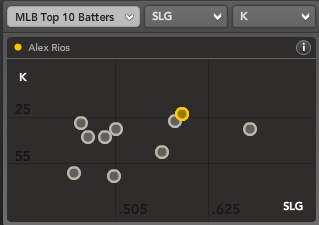 Following last season’s mid-summer waiver claim by the White Sox, Rios hit just .199/.229/.301 for his new club for the rest of 2009. However, the 29-year-old rebounded to post numbers above his career average across the board in 2010. 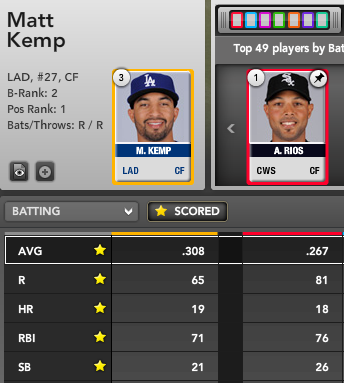 His .284/.334/.457 slash line slightly bests his career .281/.331/.446. More importantly from a fantasy perspective, he regained his great power/speed combo, smashing 21 home runs while stealing 34 bases. He also crossed the plate 89 times and added 88 RBI. With 2009 looking like the outlier, expect numbers close to career averages again in 2011. Beckham impressed in his first 400 major league plate appearances by hitting .270/.347/.460 as a rookie second baseman. In nearly 500 PA this year, he hit just .252/.317/.378. His home runs dropped from 14 to nine and his RBI from 63 down to 49 – despite playing in 28 more games. There’s nothing that screams fluke in either season, which leaves Beckham’s owners scratching their heads moving forward. If he’s valued as a .250 hitter with light power at the draft table next year, though, he’s well worth grabbing at that price. A Cuban defector, Viciedo showed some of the power the White Sox hoped to see when they signed him. After hitting 20 home runs in 86 games at the Triple-A level, the 21-year-old was promoted to the big leagues. There, he it .308/.321/.519 with five home runs in just 106 PA. His average is fueled by a rather unsustainable BABIP (batting average on balls in play) and his plate discipline leaves much to be desired (two walks and 25 strikeouts). But with plus power at the hot corner, the Chicago third baseman of the future is one to keep. Konerko has been one of the most underrated hitters of the past few seasons, but pardon me for being a little wary of a 34-year-old posting a career-best .977 OPS. While playing in one of baseball’s home run havens, nearly 20% of Konerko’s flyballs hit went over the wall. In addition to a favorable home run rate, his BABIP .326 was well above his career .285 level. A free agent this off-season, Konerko’s next destination is unknown. But it is very unlikely his OPS approaches 1.000 again next year. Don’t overbid. 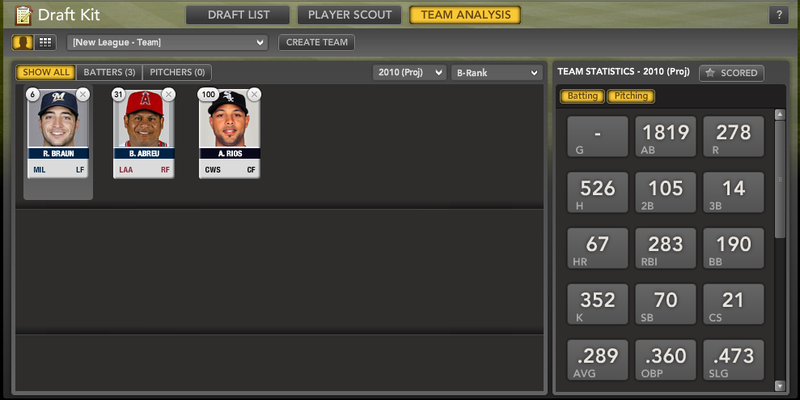 For more on Alex Rios and the Chicago White Sox lineup, check Bloomberg Sports’ Fantasy Kits.